The other night I had a vision during meditation. I came across a few cloudy shapes and couldn't make out what they were, either trees or just mist. Sometimes visions are blurry if I'm not fully concentrating. I was astral travelling, and wandered off. I sometimes hope to visit other realms one day but can't. Then I started to see something. What came into my head was Garm, the name of a hound in Norse mythology that guards the underworld. What I soon saw was a shape in the mist of a black dog/wolf. This particular canine was very big. It was much bigger than a German shepherd, and larger than the size of an average male grey wolf. The face itself was dog-like but not familiar features of a wolf or a domestic dog. It's eyes were blazing, almost the colour of blood. I was afraid but also felt respect of the animal. I stopped meditating. Did research on both Garm and the physical appearance of the animal in my vision. There are many such hellhounds of the underworld featured in many myths. The most famous is Cerberus of Greek myth, who is a ferocious three-headed dog. Garm is considered "blood-stained" and sits at Goddess Hel's gates. Some scholars confuse Garm with the giant wolf Fenris as both are linked to tales of Ragnarok. Like the three headed dog Cerberus, Garm has an unusual feature of four eyes! In Hindu and Persian myths are four eyed dogs that guard the gates of the underworld. Both Cerberus and Garm sit at the gates of the underworld and stop the dead from going across to Midgard. Apart from that, reports from people who've claimed to have seen hellhounds such as these describe them as having almost a phantom quality, black fur, intelligent and with red eyes (similar to the big dog in my vision). Some have seen these dogs during a very bad paranormal experience or a nightmare after playing with the occult. Such dogs are embedded in folklore. 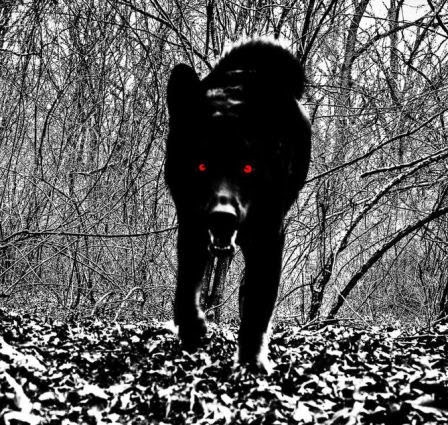 In England, shadowy red-eyed dogs are nicknamed Black Shuck, who often linger around cemeteries and graveyards. In Wales, this dog is well known as Cwn Annwn who is part of the legendary Wild Hunt, as Garm is of the Wild Hunt too. In some parts of Wales, the people call it Gwyllgi and this dog is considered a "mastiff" because of it's enormous size and red eyes!!! Now beside the myths, legends, folklore and stories, I was looking into more biological answers. There are many dogs and wolves and none that looked like the dog form in my vision. What was it? Was this Garm? Maybe it was but what sort of canid was Garm? Instead of talking about the supernatural or the symbolic (three heads and four eyes), let's go a wee bit scientific. I checked out the origins of domestic dogs first going back to a common ancestor, Canis Lupis. The earliest type of other wolf that existed was a Dire Wolf. It was larger than today's wolf and its head shape was a little bit different to the modern grey wolf's. The Dire Wolf was part of the prehistoric megafauna that existed during the Pleistocene age but was slow due it's size and weight. It's teeth were very large and was capable of crunching on bone. These Dire Wolves became extinct more than 10,000 years ago during the arrival of grey wolves and humans. However, even though Dire Wolves looked like the dog in my vision, there is a problem of geography. The Dire Wolf was confined to the Americas. Who was the ancestor of the Grey Wolf? The Tomarctus canid lived millions of years before the Dire and Grey wolf and believed to be the direct ancestor of wolves and dogs. However, it lived in the Americas and was much smaller in stature. There was the other canid group Borophaginae who were "bone crushing". Fossils of this animal was found only in North America. Cynarctoides canines lived in the Americas over 20 million years ago. All this becomes too vague as no one really knows exactly who or what evolved into the modern wolf and the domestic dog. The latter started off living with humans thousands of years ago during the last Ice Age, somewhere in the Middle East. It's not known if wolves traveled across the land strait to the Americas from Europe or vice versa. Some think now it happened the other way round giving the amount of fossils on record. Most biggest question of all what are the origins of the hellhounds? Like some people explain that dragons are a primitive ancestral memory of dinosaurs, are these big mythical hellhounds our ancient memory of Dire Wolves?